Ahoy! 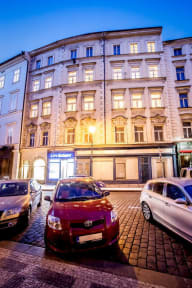 Hostel is perfectly situated within 5 a minute walk of Old Town Square, Charles Bridge and various restaurants, bars and clubs. Well connected to the airport, bus and train station so you have less time commuting and more time to explore. We are in the 17th century building with all the charm and character you’d expect (including stairs). Don’t worry, our staff are happy to get the exercise and help you carry your luggage if needed. Our helpful staff who speak multiple languages (or at least attempt to) will be ready to help you plan your day, give great advice and show you our beautiful city. Our staff are available to help you 24/7 so don’t worry if you arrive early or need to leave late, you can still use our facilities and store your bags in our luggage room. We have a packed activities calendar so be sure to ask at reception what’s going on during your stay. If you are looking to unwind over dinner, a few beers or bottle of wine in great company join our family style dinners. If you want to experience the local nightlife after dinner, join us at local bars/clubs or on the bar crawl. Enjoy the daytime on a free walking tour, beer garden tour, riverside party and much more. We have a fully equipped kitchen including tea, coffee, spices and other basics that you can take full advantage of. Also, two smaller kitchenettes for your comfort and ease. We have a dining/lounge area where you can enjoy dinner, drinks and play board games. Ahoy! 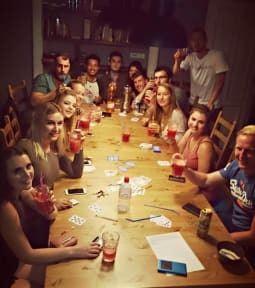 is a place to feel at home, relaxed and enjoy socialising with others. Please Note: The remaining balance is to be paid in cash in either EUR or CZK upon arrival. The hostal was great. Very clean, excellent location, staff was amazingly helpful with all my doubts and helped so my stay was good. Everything was great! Amazing place. Loved the Cafe on the ground where we had a breakfast and hot dinner every day. Lots of fun with evening staff. Surely will be back. Got 8 bed dorm to myself! Great hostel near the old town square and plenty of bars, restaurants, river, etc. Staff was super great and helpful. Breakfast/dinner offered at great prices. Be aware, however, that you will be in the downtown area. If your room windows face the street, you will be hearing outside noise! I had to sleep with earplugs! Good way to get a cheap clean bed place in a center of Prague, with friendly hostel staff, tasty breakfast and free wi-fi! Good hostel! Would stay again. It’s a normal hostel, but the staff is so gently, the kitchen is full equipped. I had no issues with security, but it would be nice if you implement key-cards just in case, cause not everybody that was in the room was aware of closing with key when they left, or even, closing properly the street door. Lovely staff and excellent location. Toilets could be a little cleaner and the breakfast was a little disappointing. Would recommend the staff's dinners though. Great location. Clean rooms and facility. Super friendly and helpful staff. Unfortunate street noise was my only complaint.